When does exporter get EP copy of shipping bill after customs clearance? I have written a couple of articles in detail in the same website about the mechanism of export customs clearance and procedures on export. I have written about - ‘What happens, once cargo for export moved out from exporter’s factory’ with the procedures and formalities to be complied with the authorities. You may read the same also to have a deep knowledge on the subject, as I have mentioned in simple language to understand for beginners of international trade. Here let us learn, when can an exporter gets EP copy of shipping bill. The exporter receives exchange control copy of shipping bill with exporter’s copy of shipping bill immediately up on completion of export customs clearance formalities. Exchange control copy of shipping bill has to be submitted with their authorized dealer bank, in turn bank sends the said exchange control copy of shipping bill to Reserve bank who monitors inward and outward remittance of the country. Although exporters obtain exchange control copy (EC copy of shipping bill) and exporters copy of shipping bill duly signed by customs authorities to let for export the goods to foreign country, such EC copy and exporter’s copy is not treated as a proof of export. Why EC copy of shipping bill or exporter’s copy of shipping bill is not treated as proof of export by customs or other government authorities. As you know, the meaning of ‘export’ is to move goods to a place outside the country. This means, the goods intended to export need to be moved outside country. So, while issuing EC copy of shipping bill or exporter’s copy of shipping bill, the goods may not have moved out of country as such shipping bill is only a proof of completion of customs clearance formalities and permission to move the goods from the country. Here the question is, when can an exporter eligible to obtain EP copy of shipping bill. Before answering this question, let us find out – why EP copy of shipping bill is required for an exporter. Why can not manage with EC (exchange control) copy of shipping bill or exporter’s copy of shipping bill. All government agencies accept EP copy of shipping bill as a proof of export as one of the documents. This EP copy of shipping bill issued by customs department declares that the goods mentioned in the documents have been exported. Exporters are eligible for various export benefits from different agencies including financial assistance and Export promotion copy of shipping bill need to be submitted with them along with other documents. How long will take to issue EP copy of shipping bill after obtaining EC copy of shipping bill or after completion of customs clearance. 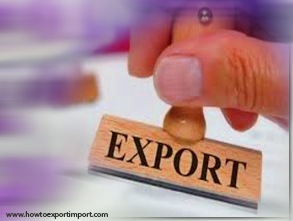 Let us find the mechanism of procedures after completion of export customs clearance procedures. What happens to the cargo, once after handing over necessary shipping bills to shipping company, as proof of completion of customs clearance. Once after receiving shipping bill as proof of completion of export customs formalities, the shipping company as carrier of goods arranges to move the said goods to the destination where exporter wants, as per shipping documents mentioned. The goods are moved out of country by road, rail, air or sea. In most of the export business transactions, the goods are moved either by air or sea. Once after crossing the territorial border of the exporting country, the carrier of goods (shipping company) must file the details of goods exported with the customs department. Such details are mentioned in a specified format advised by customs department which is called ‘Export General Manifest’ EGM. Filing of EGM is mandatory and Export General Manifest is a legal document to be filed by shipping carrier with customs department, once goods crossed border of the country. The shipping carrier (vessel owner or his agent, aircraft owner or his agent, freight forwarders, consolidators ) mentions the details of vessel/aircraft or other carrier, quantity, number of pieces, description of goods and other required information specified by the authority in EGM. Once after filing of such EGM by shipping carrier who moved goods out of country, the exporter or his authorized customs broker can apply for obtaining EP copy of shipping bill with customs. If the shipment was effected in a custom location where shipping bill filed manually, the exporter or his customs house agent can submit necessary export promotion copy of original shipping bill and obtain approval from customs department by mentioning EGM details. If the shipment was effected in a customs location where EDI (Electronic Data Interchange) facility is available, exporter or his customs house agent can apply to obtain copy of print from EDI and arrange to get approval (endorsement) on such hard copies of EP copy of shipping bill by mentioning the details of EGM. In this article I have explained about release of EC copy and EP copy and its process of release with Indian Customs department in simple language. What is your experience in handling EP copy of shipping bill? Would you like to add more information about release of EP Copy of Shipping Bill? Share below your suggestions and experience about the time of releasing EP copy of shipping Bill. How to claim scrips from DGFT, if eBRC, EP copy of shipping bill lost? I hope, I could satisfy you on the subject. If you have different thoughts, please discuss below. Dr. Anil Suneja: On 27 May 2013 Good. My further query is , if Indian exporter sells goods to foreign buyer but said foreign buyer after clearance from the Indian custom but before movement, sells goods back to some other Indian person and the new Indian buyer sells goods to some other country, which kind of sale this would be for the second Indian buyer. surendran: On 01 June 2013 Hi Dr.Anil Suneja, There are many parameters involved in this 3 transactions. Whether any advance amount recieved from 1st transaction against export? Whether claimed any export benefits? since cargo not moved from Indian port, EP copy of SB can not be released. The reselling transaction between foreign seller with new buyer can be hidden to avoid complication which is immaterial with RBI,customs and other Indian government authorities. Shut out procedures can be followed for 1st transaction and arrange new documentation procedures for last transaction. rajani: On 17 June 2013 in air customs clearance exporter get shipping bill exporter copy?? suryaprakash.h: On 19 February 2014 How To obtain Previous Years (2011-12) EC Copy Online. Shrishailiya: On 06 January 2015 Dear sir, we have despatch under LUT bond but party not giving shipping bill of EP & only provide EDI copy. then how will collect this copy for POE. please help. BIMAL KUMAR: On 27 March 2015 dear sir, kindly update me in which case EP COPY is not mandatory..
himanshu: On 16 June 2015 can invoice value be more than shipping bill value. i mean amount of invoice can be increased after filling shipping bill. Venkat: On 13 July 2015 Dear Sir, Please guide me whether customs documents like invoice, Shipping bills, AR4 will be affixing seal and signature by customs for export shipment.If not what is the proof of export. Is EP copy and Exchange Control copy both and AR4 will be having seal and signature of customs office. paras ramtek: On 02 December 2015 Dear Sir, Thank you for en-lighting on EC and EP copy, I would be glad if you would explain the field 41D, 78 and 57 D ? nagesh: On 29 February 2016 Sir, after clearing of imports thru clearing agent we are getting duplicate and triplicate copy from the agent. What we have to do ? can we submit the same (EC copy ) to the concern bank ? Jayaraman Venkatraman : On 24 April 2016 I need valuable advice to solve one problem By overlooked our CHA has prepared the checklist by mentioning wrong HS code of our product and accordingly EP copy generated in wrong HS code for our financial year 2015-2016 shipping bills from April to November. We are unable apply MEIS scheme in this issue. We need to amend this in correct classification of HS code in EP copies for claiming MEIS. Anmol Mothay : On 09 August 2016 My name is Anmol Singh Mothay, i am working in merchant export company. I am really confused in the subject mention. Please clear my doubt. I will be really obliged in your guiadance. Subrahmanyam MV : On 13 August 2016 This is Subrahmanyam, working as warehouse Executive.Previous Experience in Export warehouse. I would like to know all procedure of import and exports, Freight Forwarding and Excise related. Kindly share me your knowledge. SURESH: On 07 November 2016 What is processor if EP copy lost and required to submit.